Available Mini Aussie puppies from November 2008 at Breezemore's Maine Miniature Australian Shepherds. 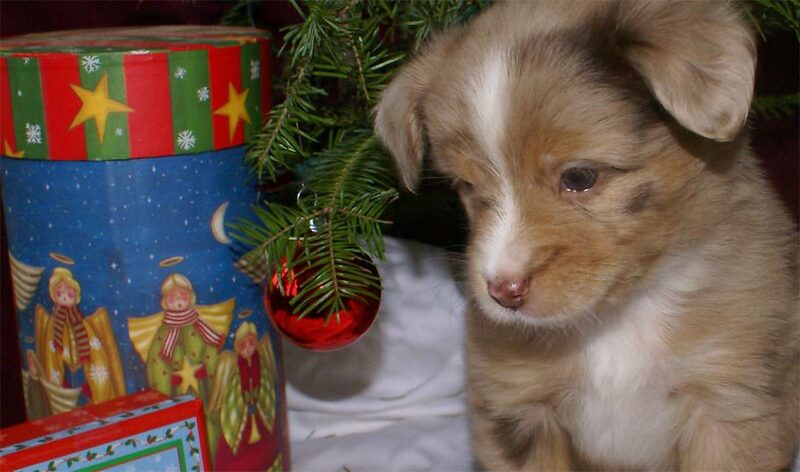 November 2008: New Miniature Australian Shepherd Puppies! This litter of seven puppies (2 females and 5 males) is from Maggie and Eli on November 13th. You can e-mail me at breezemore@gmail.com for more information, questions or pictures. A copy of our puppy contract can be downloaded here. All the following pictures were taken on December 21st 2008, at 5 weeks old. She has unique merling and her eyes will most likely be blue. Sold, Thank-you Lisa. She has named her Gracie! She's very petite; she's a small mini, possibly a toy. She has vivid copper trim. We've been calling her Butters because she melts when you hold her. Sold, Thank-you Manda. She has named her Harley! He's the largest pup and is nicely marked. His eyes are most likely blue. We've been calling him Optimus Prime. Sold, Thank-you Brittany and Mike. They've named him Linus! He has nice copper trim and potentially has blue/green eyes. He's a small mini and could potentially be a toy. We've been calling him Bread Loaf. Sold, Thank-you Suzanne and John. They've named him Farley! He's a social pup with a half collar and a nice blaze. He has a wide blaze and nice copper. Sold, Thank-you Leah. She's named him Milo!